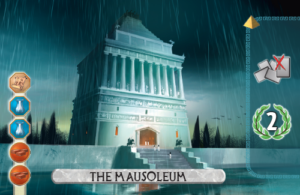 The Mausoleum might very well have the strongest effect of all wonders in 7Wonders Duel, but it requires a skilled player to use it optimally. The Mausoleum lets the player who builds it obtain a card from the graveyard for free. The graveyard in 7Wonders Duel is filled with the cards that players didn’t buy during the game. Often, the graveyard is filled with expensive cards, because players tend to refrain from buying a card if they find it too expensive. The Mausoleum effect is so strong, because it burdens your opponent with the task of keeping the graveyard empty. Or at least, your opponent has to think twice before he sends powerful military cards or science cards to the graveyard, because you threaten to bring it back later with your Mausoleum. Thus, merely the threat of your Mausoleum forces your opponent to buy many expensive cards, to prevent that you can obtain these expensive cards for free. This places a heavy economic burden on your opponent. However, in some games your opponent has such a strong economy, consisting of many resources card and commercial cards, that he can manage to keep all expensive cards out the graveyard without any major expense. And if your own economy is strong too, the Mausoleum effect will be very underwhelming, because your opponent and you will simply buy all the powerful cards and there won’t be any cards to bring back from the graveyard. To prevent that the graveyard remains empty, you must thus make sure that your and your opponent’s economies are weak. The weaker your economies, the more cards you will both send to the graveyard, and thus the stronger your Mausoleum effect will be. Making sure that your opponent and you have weak economies is actually quite easy in 7Wonders Duel. Players are often faced with the choice to make both players better off, or both players worse off. For example, if you primarily need wood for your wonders and your opponent needs primarily stone, and you can choose between taking a wood resource card or a stone resource card, what do you do? If you have the Mausoleum, you leave the wood for your opponent and you take the stone! This way, your opponent and you will both need more money to build your wonders, and thus you will have less money available to buy other cards, Thus, you must send more cards to the graveyard, and this charges your Mausoleum effect. These choices between making both players better off or making both players worse off occur all the time in 7Wonders Duel. If you have a papyrus and your opponent a glass, and you get to choose between a papyrus and a glass, you can take the papyrus and leave the glass for your opponent to make both players worse off. You typically won’t need more than one of these kinds of resources, thus both players benefit very little from their extra resource. Whereas, if you would have taken the glass an let the papyrus for your opponent, both players would benefit a lot from their resource. Generally, if both players monopolize one resource, they need to spend a lot more money during the game than if they share the resources equally. Thus, next time you have the Mausoleum, engage in a trade war to trigger an economic recession and reap the benefits! > Click here to buy 7Wonders Duel and try out this Mausoleum trade war strategy!